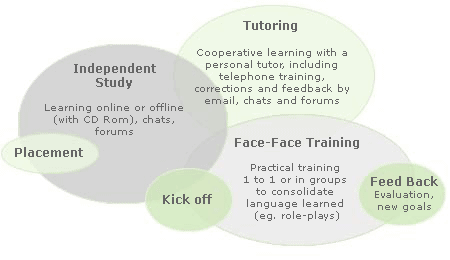 The Virtualingua method – also known as blended eLearning – is a diverse mix of independent study, personal tutoring (correcting weaknesses, giving feedback, communicating) and live training by video conference. We've seen time and again that learning a language with eLearning can only be truly effective when the student has opportunities to apply what he or she is learning, orally and in writing and when the student can benefit from the help and motivation of qualified language trainers. We have trained many native speaker language instructors to serve as personal tutors to work with you throughout your course. It’s necessary to interact and communicate in order to learn a language, even the computer age hasn’t changed this age-old fact. Using German to communicate takes you from being someone who understands the language to being a real speaker. During your entire virtualingua course, your personal tutor is at your disposal so that you can use the language you are learning. Studying with a tutor ensures lasting learning. Your tutor will help you to structure your course, talks with you and motivates you. The levels of our German courses correspond to the Common European Framework of Reference for Languages, levels A1-C2. We help you to get more information about exactly which skills you should have at each level and which standardized tests you can take at each level.Just contact us. You can test your knowledge of German using our online placement test. We can use the results to recommend the right course for you. When you complete your virtualingua course you will receive a certificate showing which level you completed successfully, the length of the course and course contents. The levels listed on our certificates correspond to the levels of the Common European Framework of Reference for Languages, so they are recognized in all of Europe.